Thank goodness for Real Simple and the recipes that actually are really simple! Heat 1 tablespoon of the oil in a large nonstick skillet over medium-high heat. Season the fish with 1⁄4 teaspoon each salt and pepper and cook until opaque throughout, 4 to 5 minutes per side. Meanwhile, heat the remaining tablespoon of oil in a second large skillet over medium-high heat. Cook the peppers and onion, stirring often, until tender, 8 to 10 minutes. Stir in the olives, parsley, lime juice, and 1⁄4 teaspoon each salt and pepper. Serve with the fish. We just cut the original recipe down to fit our needs..you can see the original here. 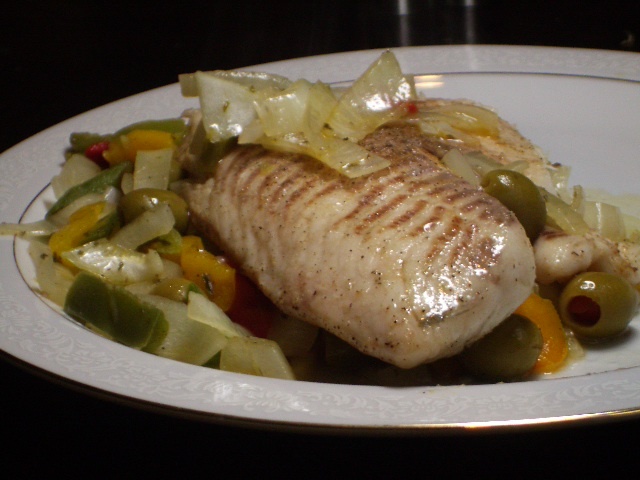 Tilapia and green olives are two of my favorite things! I’m going to make this. Thanks!